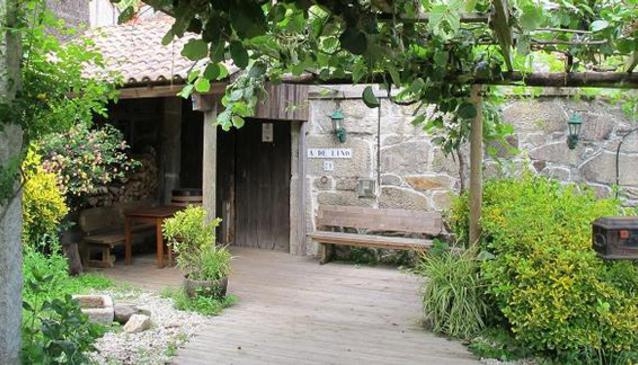 Taberna A´de Lino, can be considered as a reference in Peninsula do Morrazo, as an example of fusion between making business and recovering the past for it can be seen as a little 'ethnic museum'. You can enjoy a good meal while listening to a live concert of traditional music, or you can join a group of people singing traditional songs around a bottle of wine or a 'queimada' until late at night. In Taberna A´De Lino you will find plenty of dishes: many different types of sausages to start with, the always tempting seafood (shrimps, razorclams, crabs...) which are its main dishes along with other important inhabitants of our estuaries: octopus, squids, etc. We can also enjoy richer dishes: tripes, chorizo (cooked in wine, cider or liquor), the typical pies made with wheat or corn flour, spanish omelette, scrambled eggs with different ingredients, and starters like pimientos de Padrón or assorted salads. But one of the most delightful surprises Taberna A De Lino can offer is the huge variety of home-made desserts: filloas, Galician cheese with honey or quince, rice with milk, kiwi with honey, cheesecake and the speciality of the house, tart of biscuit with chocolate. But once you have started your meal, it would not be perfect if we didn't taste a good wine like Mencía, Albariño, Ribeiro and Godello, coming from different regions of Galicia, along with the quality of the wines from La Rioja, Ribera del Duero, Navarra, Toro and Extremadura. All these wines come with a guarantee of origin and are represented by the best brands which we will find in the wine list of Taberna A´De Lino. In summer open every day (except Mondays) from 18.00. On saturdays,sundays and bank holidays from 12.00.